Here's how to trade four of the most active names on the market Thursday. From hedge funds to individual investors, scores of market participants are turning to social media and market data to figure out which stocks are worth watching. It's a concept that's known as "crowdsourcing," and it uses the masses to identify emerging trends in the market. First on our list of Thursday's most actively traded stocks is $233 billion retail giant Walmart Stores Inc. (WMT - Get Report) . Shares of Walmart are up 2.2% today, hitting new 52-week highs intraday following first-quarter earnings. Walmart posted a first-quarter profit of $1 per share, besting the 96-cent earnings that Wall Street was expecting. 63% year-over-year growth in e-commerce sales is helping to fuel the positive sentiment in this retail stock. Technically speaking, Walmart's price action looks strong right now. 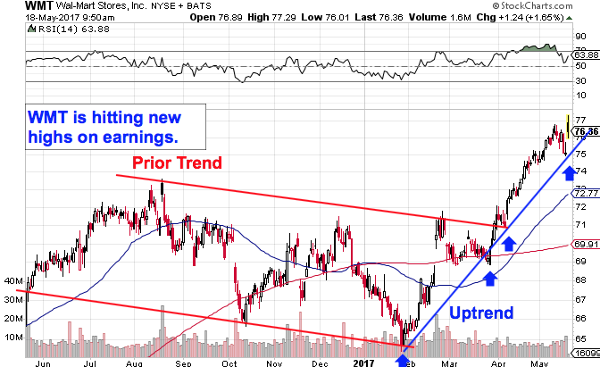 Shares broke free of a long-term downtrend back at the end of March, and they've been pointing higher ever since. Now, new highs are clearing the way for a re-test of this stock's all-time highs just below $91. Importantly, Walmart's earnings buck the trend of retail disappointments this quarter, which should make shares a magnet for investors dollars this summer. Another huge earnings-driven mover Thursday is Alibaba Group Holding Ltd. (BABA - Get Report) . This Chinese e-commerce behemoth is down 2.9% as I write today, dropping following a miss for fourth-quarter earnings. Alibaba reported adjusted earnings of $4.35 per share, just missing the $4.50 profit target that analysts were hoping for, on average. While Alibaba is down Thursday, it's not out. 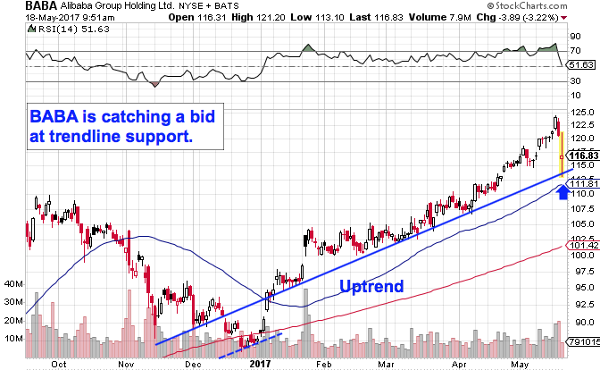 Alibaba has spent all of 2017 in an uptrend, and while shares dropped down to test trend line support in Thursday's trading session, the selling stopped at that long-term price floor. That makes today's dip in BABA look more like a buying opportunity than a cause for concern. The next up-day is confirmation that it makes sense to buy. The iShares MSCI Brazil ETF (EWZ - Get Report) is near the top of the list of the NYSE's most actively traded issues today, free-falling nearly 17% as I write, after corruption allegations that President Michel Temer is involved in a cover-up scheme involving a payment to former house speaker Eduardo Cunha. This latest political crisis sent Brazilian bonds plummeting, with equity prices in the country dropping alongside them. 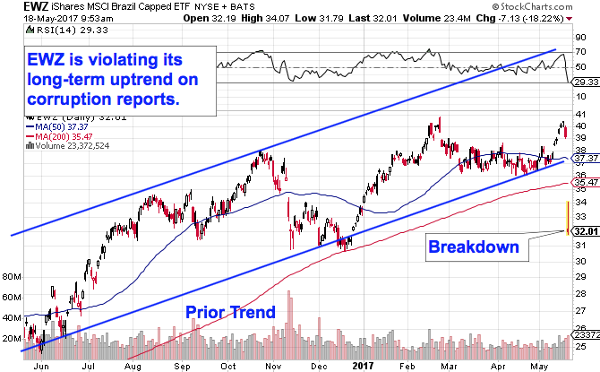 As one of the easiest ways to gain exposure to Brazil, EWZ is one of the biggest stateside losers from the scandal. While this ETF has been a strong performer in the past year, rallying more than 22% during that timeframe, today's drop could be the start of a move that totally unwinds those gains. Shares are violating the uptrend that's propelled EWZ higher since last summer. If you own this ETF, consider selling before shares see more downside. Finally, Cisco Systems Inc. (CSCO - Get Report) is tumbling 7.4%, following disappointing sales forecasts from the firm's third-quarter earnings call after the bell Wednesday. Cisco beat profit estimates for Q3, generating 60 cents per share in adjusted earnings, rather than the 57.8-cent consensus from analysts. But the firm expects as much as a 6% decline in the current quarter vs. last year, putting another 1,100 jobs on the chopping block. Long term, Cisco looks "toppy." 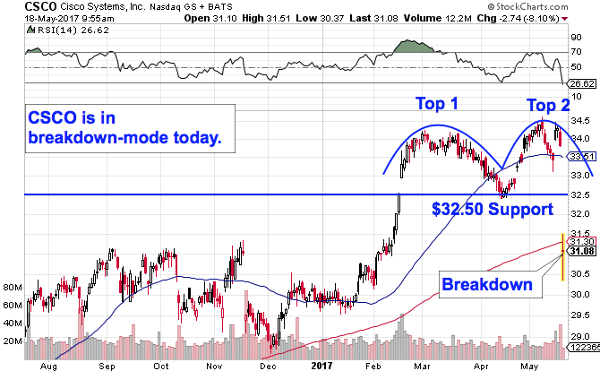 Shares have spent the last several months forming a double-top pattern, a bearish reversal setup that triggered a sell when the $32.50 level got violated at the open this morning. That drop clears the way for a downside move to prior support at $29. Buyers beware.